2019 has been off to an incredible start! So many incredible couples plus three print features! Thank you to all my amazing couples! Lots of great destination wedding tips in the article as well! 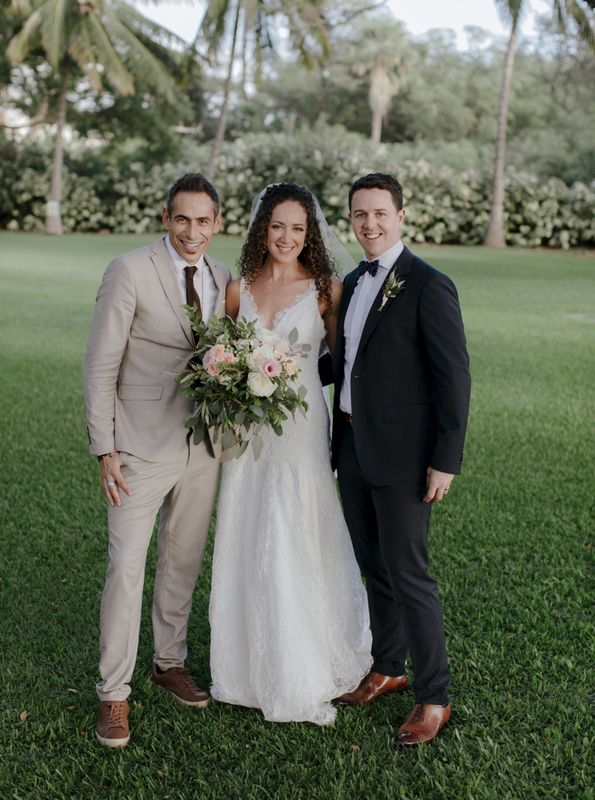 Hana & Sam through an incredible wedding bash on the Big Island of Hawaii. 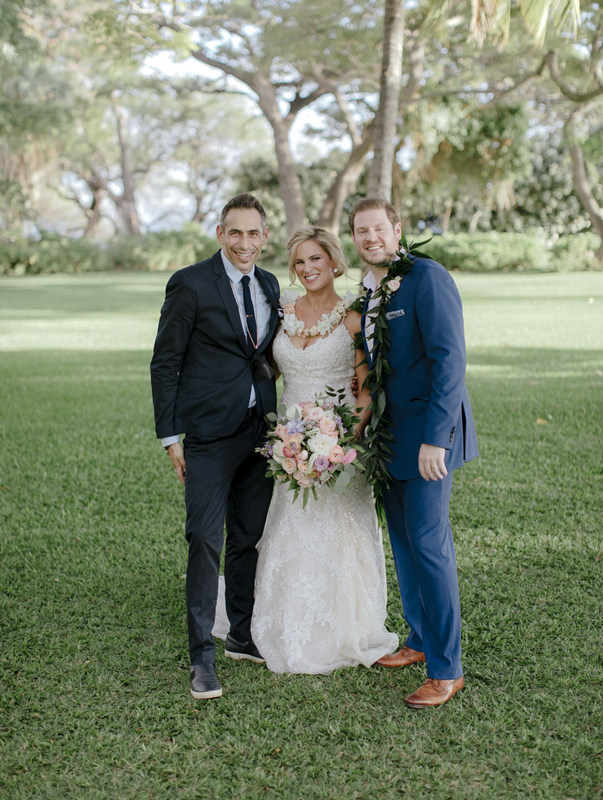 An all all-star cast of Hawaii’s top wedding pros brought their vision life! 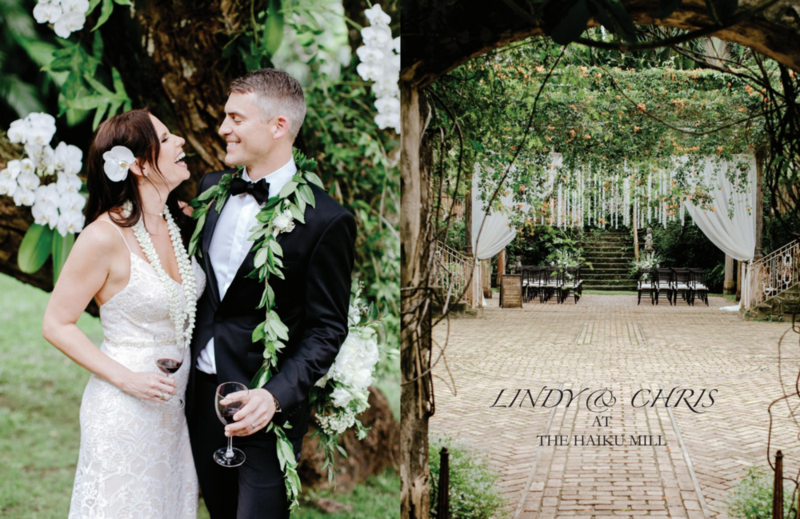 Lindy & Chris got married at the beautiful Haiku Mill on Maui. Pick up the latest issue and enjoy the beauty! 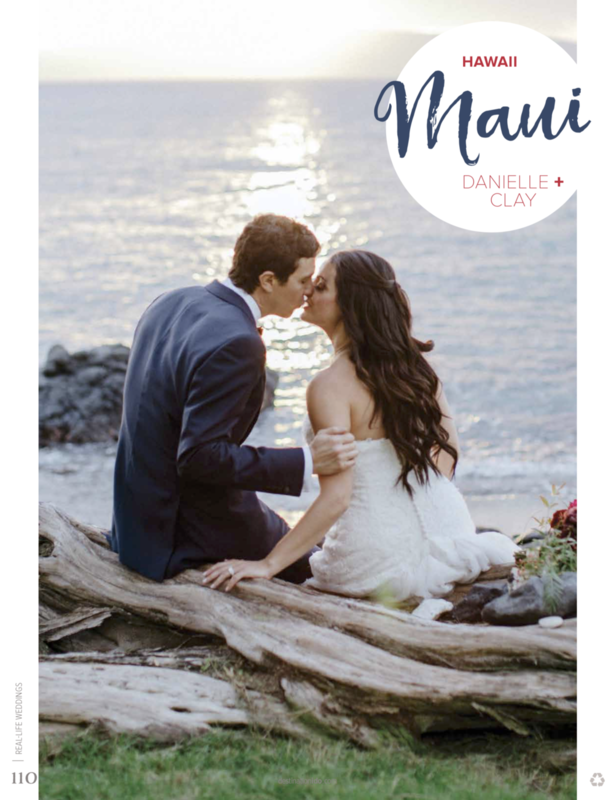 Thrilled to have this gorgeous destination Maui wedding featured in the spring Issue of Destination I Do. I am so grateful for all the incredible couples I get to work with! Capturing your wedding day is so special to me and I want to thank you with all my heart! What an honor to be named to The Knot Hall of Fame! Thank you to each and every incredible couple over the years who have trusted me with their amazing weddings! 1.14.19 Happy New Year!!! 2019 is off and running! I’ve already had the pleasure of capturing four stunning weddings for four amazing couples! Venues include Sugar Beach, The Grand Wailea, The Royal Hawaiian, Oahu and Olowalu Plantation House. Tune in all year for some incredible weddings! What an incredible fourth quarter! Gorgeous weddings on Maui and Lanai. I am so grateful to my incredible clients and my fellow wedding pros for bringing dreams to life at every event. 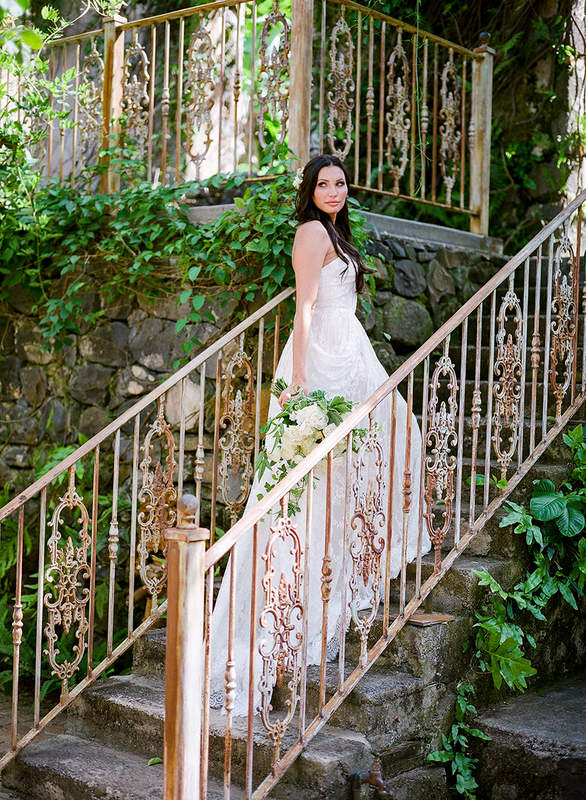 A gorgeous Maui wedding at Sugar Beach Events featuring a gorgeous statement Berta Gown. Hawaii wedding and fashion photographer Chris J. Evans lands cover of world renowned wedding publication WEDLUXE for the Fall 2018 Global trend report. 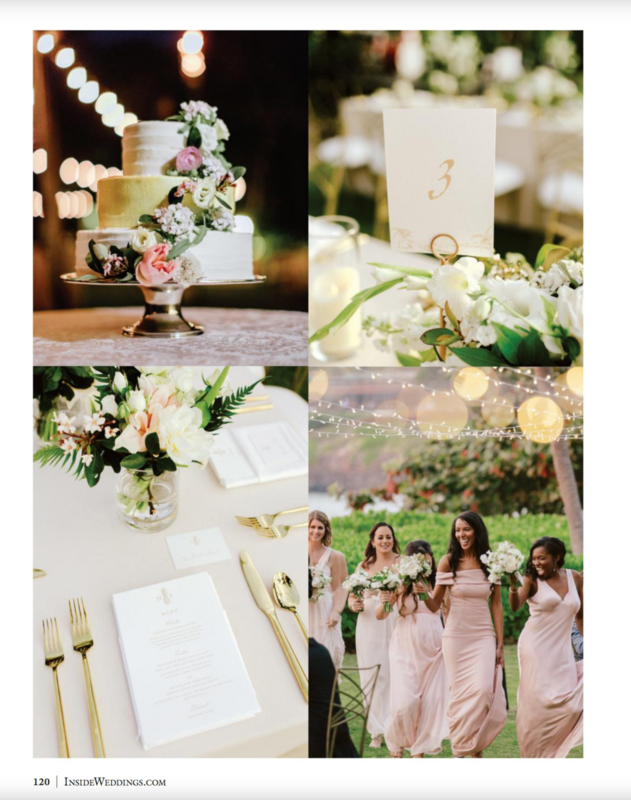 The editorial shoot was a collaboration of Maui’s top wedding talent including Chris J. Evans Photography, Shaunna Nygren, Meili Autumn Beauty, Designs by Hemingway, Zeb Films Hawaii, Costarellos and Jennifer Bher. 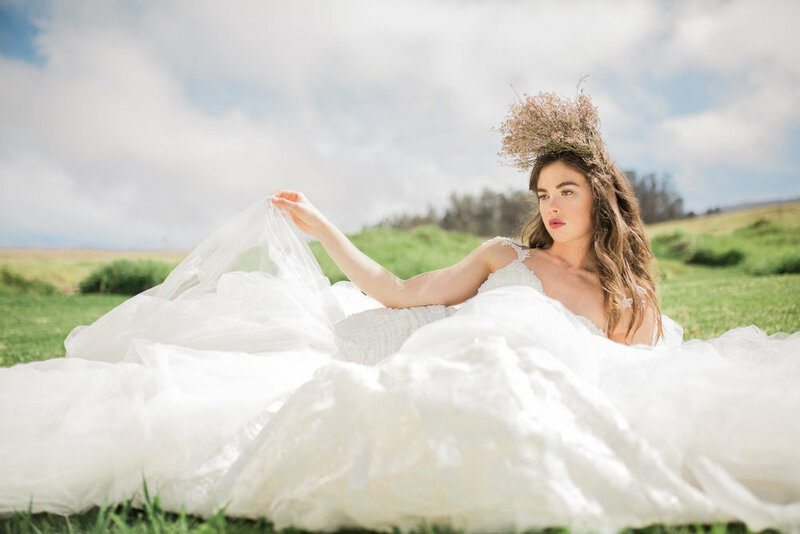 The vision was high fashion bridal editorial set against the natural, rugged beauty of O'ahu. Gowns imported from Athens, Greece by legendary designer Costarellos. Shot on location at an epic location on the south shore of O'ahu, the team visualized a concept editorial of gorgeous brides running free and being true WildHearts. The shoot not only yielded the cover but also an eight page editorial spread. 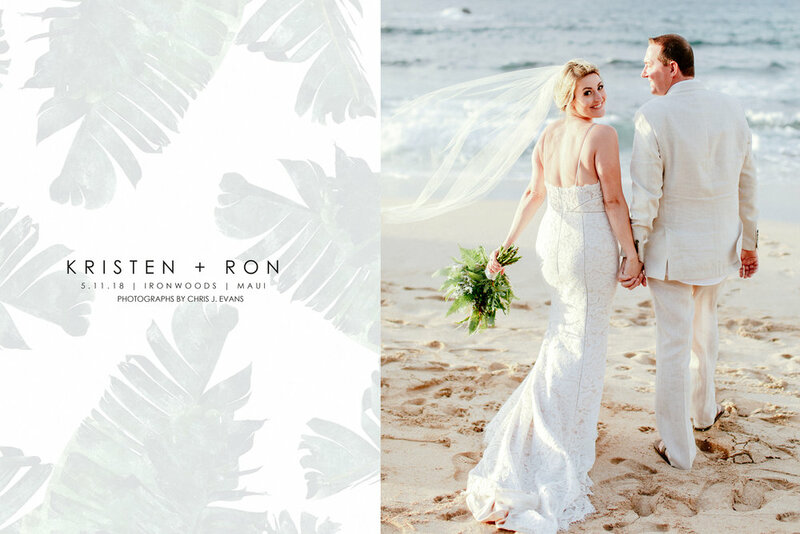 The Andaz Maui hosted this gorgeous couple for their chic tropical wedding. 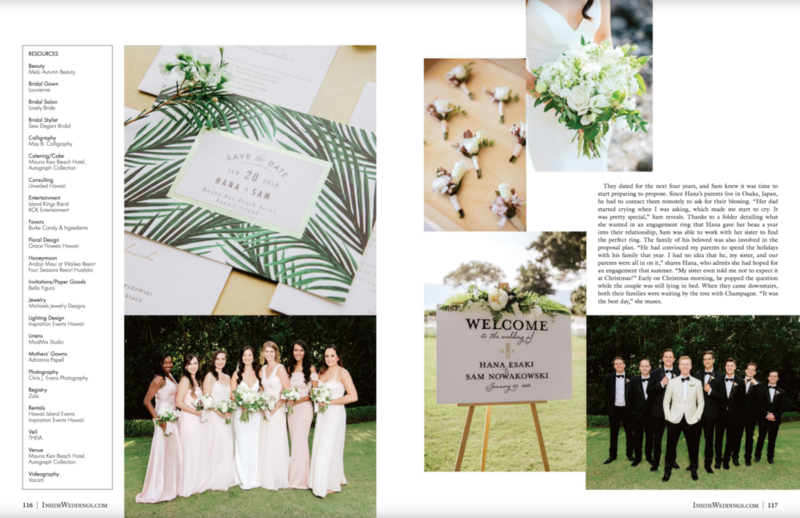 Details were on point with white, gold, green and pops of tropical color. The off shore power of hurricane Hector provided a stunning sunset full of dramatic clouds and deep hues. Our bride & groom shined in effortless elegance. I feel so fortunate for the wonderful couples who have trusted me to record the memories of their wedding celebration. Thank you a million times over for allowing me to live a life of creativity enveloped in love. Hi Gang! It has been an amazing spring! So many incredible new friends and amazing clients! Worked with so many great wedding venues including The Haiku Mill, Sugar Beach Events, The Four Seasons, The Montage and the Andaz. 2018 only has a few fall slots left and 2019 is filling up fast. Get in touch today and let's secure your date! Hi gang! Enjoy a few of my favorite summer bridal looks. I love wedding gowns and all of my amazing brides who rock them! 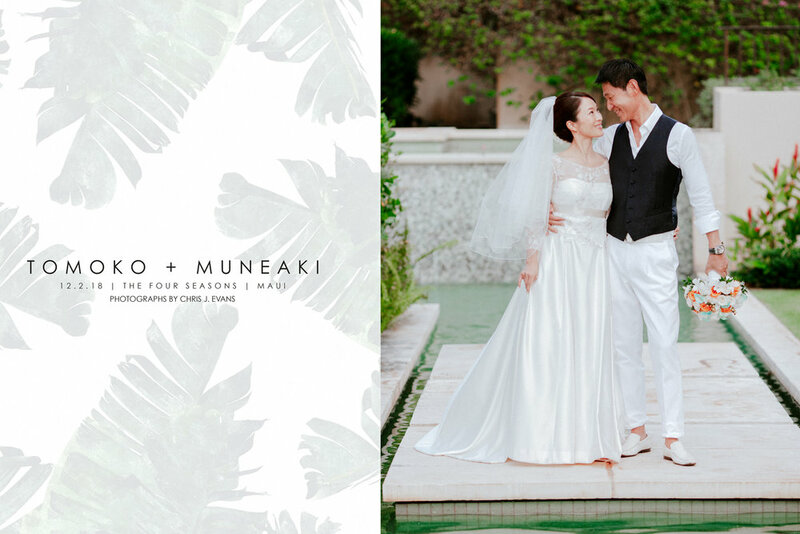 Enjoy the latest wedding film from the stunning Haiku Mill on Maui. A little rain set off this tropical paradise into a romantic short film for our stunning couple. Hi gang! I wanted to share some groom style tips for the big day. First and foremost is the tuxedo. Black, navy, white jacket or any color velvet are all amazing choices and should be the first to consider. Not only is it timeless but it exudes a sense of James Bond style. Next up is the classic suit and tie. Navy and black will always be the best choice to compliment your gorgeous brides gown. Great shoes, cuff links, wristwatch, tie clip and pocket square will have you looking sharp and feeling great. When throwing a luxury event in the islands it is key to keep the color palette clean and simple. For this amazing event by UNVEILED HAWAII the colors were gold, green and cream. The subtle accents of color softly pop and add pleasing eye candy throughout the set up. All I have to say is wow! I have the best clients in the world! I feel so fortunate to constantly get to capture so much love and happiness! The most sincere thank you to all of my past, present and future clients! Serving clients and venues in Hawaii is incredible. The Haiku Mill, The Mauna Kea Hotel, Olowalu Plantation House, The Four Seasons, Sugar Beach Events and more. View more of my galleries here. I get this question a lot about posing. I come from the world of fashion photography where the pose is everything. With that though we must understand all the elements that go into a pose. Nobody and I mean nobody even top models just get up there and hit "blue steel" out of the gate. My process is actually very organic as I will set the scene for you and capture all the candid moments leading up to the peak moment. That is the pose. It is also important to remember that this represents the smallest portion of your wedding day on average. The day is mostly filled with photo journalistic style images where I capture the true events as they unfold. I've prepared a little gallery for you to enjoy of my organic posing style. Enjoy! Maui wedding photographer Chris J. Evans talks his personal style for capturing your big day. I wanted to take a moment and chat about my style while capturing your wedding. Yes I am there to work, but I'm also present to enhance the entire day with my smile, charisma and my outfits! More often than not when I attend weddings as a guest the photographers are dressed either casual or in the standard all black outfit. The problem with all black is that if they're caught in the background of an image they'll stick out like a sore thumb. When I'm dressed up I blend right in like one of the other guests. Most importantly though I respect your celebration and I want to dress for the occasion. I can't wait to capture your big day in style! The Haiku Mill at night is amazing! 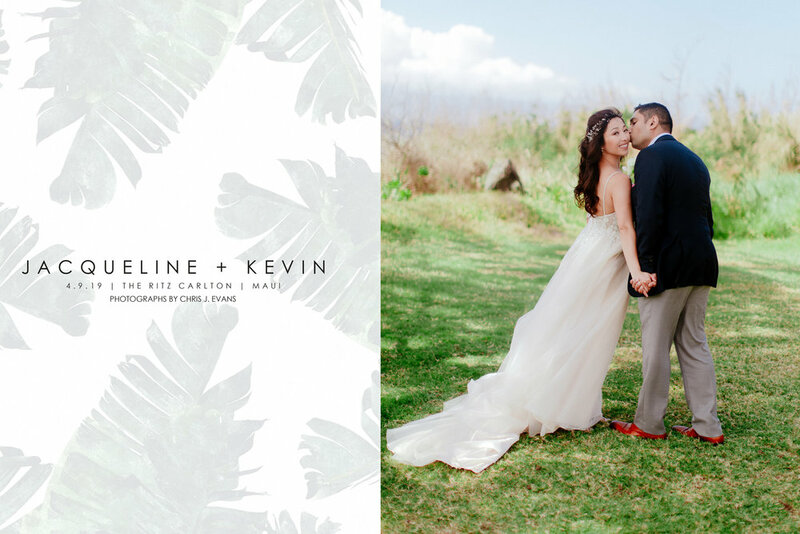 Gorgeous Maui wedding at Olowalu Plantation House. 11.3.17 Maui Wedding Photographer CHRIS J. EVANS speaking engagement. Just announced I will be a featured speaker on The KnotWorkshop Hawaii pro panel. Engagement Season is here! Book your engagement session and wedding date today! Our mission is to create style driven wedding films inspired by love, fashion and romance. 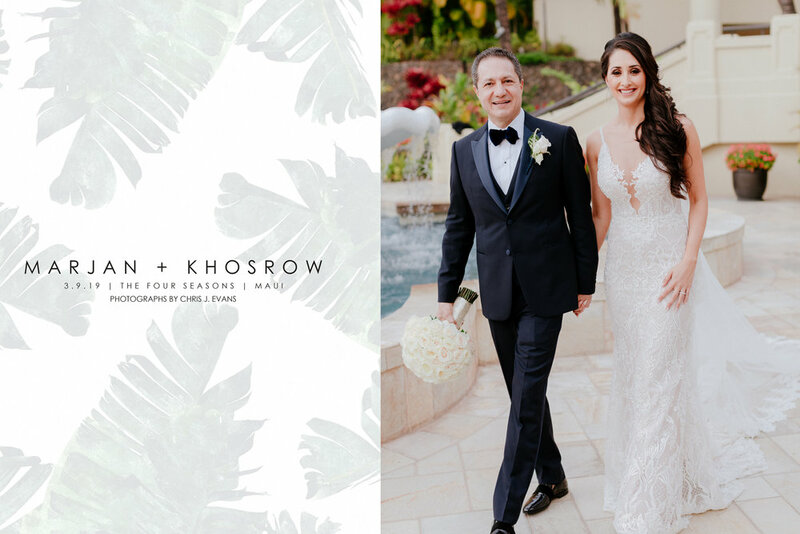 9.17.17 Maui Wedding photographer CHRIS J. EVANS featured on The Knot. 8.3.17 Maui wedding photographer CHRIS J. EVANS featured on Love Our Wedding. 6.23.17 Maui wedding photographer CHRIS J. EVANS featured on Love Our Wedding UK. Print & Online. 6.20.17 Maui wedding photographer CHRIS J. EVANS featured on POPSUGAR. 6.5.17 Maui wedding photographer CHRIS J. EVANS featured on Elegant Weddings. How to use pantone color of the year throughout your wedding. 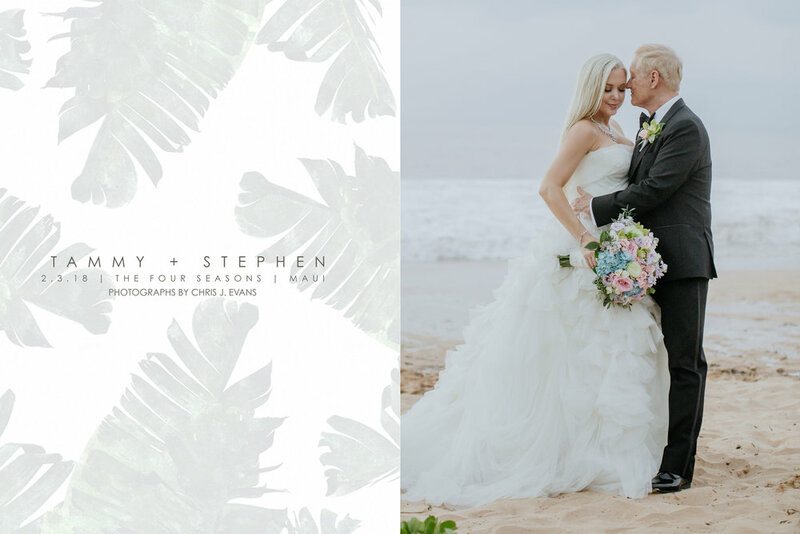 5.25.17 Maui Wedding photographer CHRIS J. EVANS featured on Rustic Wedding Chic for How to Keep Cool at Summer weddings. 5.21.17 Maui Wedding Photographer CHRIS J. EVANS Mid year client features. 2017 has been off to an amazing start! Here are just a few of my amazing clients from the 2017 wedding season. Don't let a little rain spoil your day, It can turn the ordinary into extraordinary! 4.12.17 BRIDES Magazine featured image. The 60 prettiest hair styles from real weddings. I love spring time! Lush greens and gorgeous flowers popping color here, there and everywhere! Here are some of my favorites. Enjoy! 4.10.17 Brides Magazine featured image. I absolutely love vintage Polaroids! The fact that this camera is from the the 1960's and the film is practically obsolete makes each capture a true memento. When I hand it off to my couples as well, I love they way they pose for each other, so playful and flirty! 4.8.17 CHRIS J. EVANS Featured on Inspired By This. 4.5.17 CHRIS J. EVANS featured on Brides.com "Wedding Invitation etiquette"
4.2.17 CHRIS J. EVANS captures a smokey elopement on Maui. This super stylish couple wanted a James Bond vibe. Mission Accomplished. 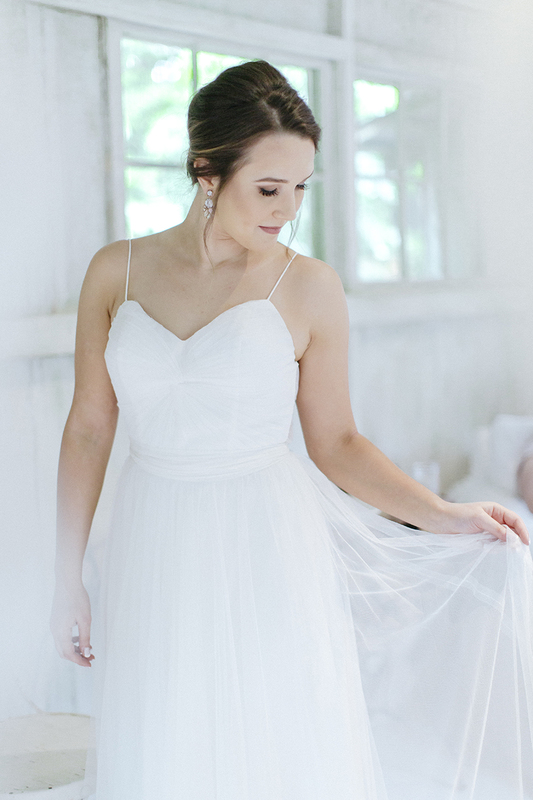 Editorial: Gorgeous wedding dress inspo for the non-traditional bride. 3.24.17 Maui Wedding Photographer CHRIS J. EVANS on green as Pantone Color of the year. Green is an amazing hue as it represents new beginings, which is perfect for the wedding indusrty. Here are a few of my favorite images featuring green. 3.22.17 Maui Wedding Photographer CHRIS J. EVANS featured on Strictly Weddings. 3.21.17 Maui Wedding Photographer CHRIS J. EVANS featured on Brides.com "Tips for bridesmaids". 3.17.17 Maui Wedding Photographer CHRIS J. EVANS named #1 wedding photographer in Hawaii by Hawaii Magazine readers. 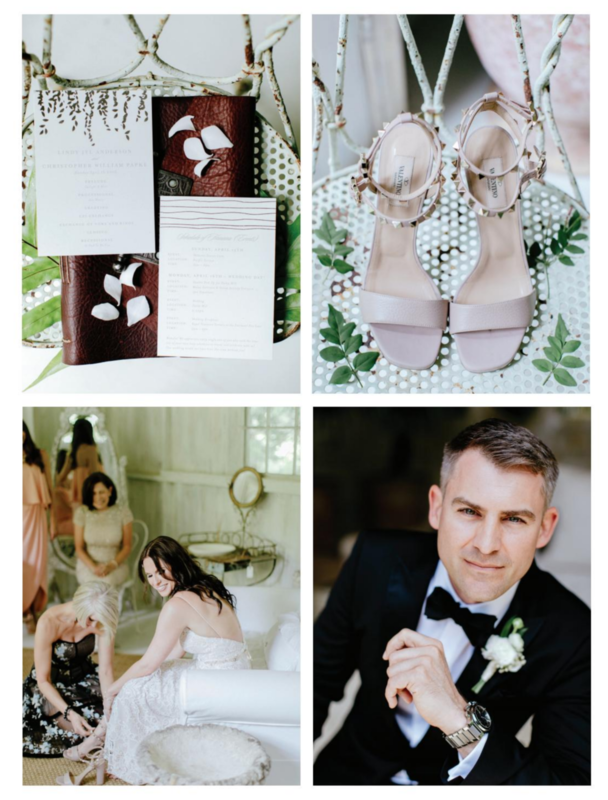 2.17.17 Maui Wedding Photographer CHRIS J. EVANS Featured on Green Wedding Shoes. Chic Desert Wedding. 2.16.17 Maui Wedding Photographer CHRIS J. EVANS Featured on Strictly Weddings. Chic Island Wedding. 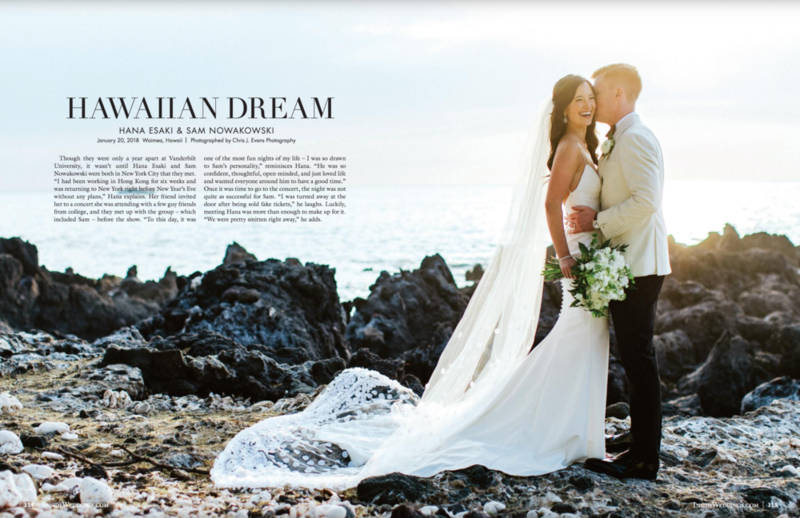 2.15.17 Maui Wedding Photographer CHRIS J. EVANS featured in Hawaii Magazine. 12.28.16 Engagement Season has arrived!! 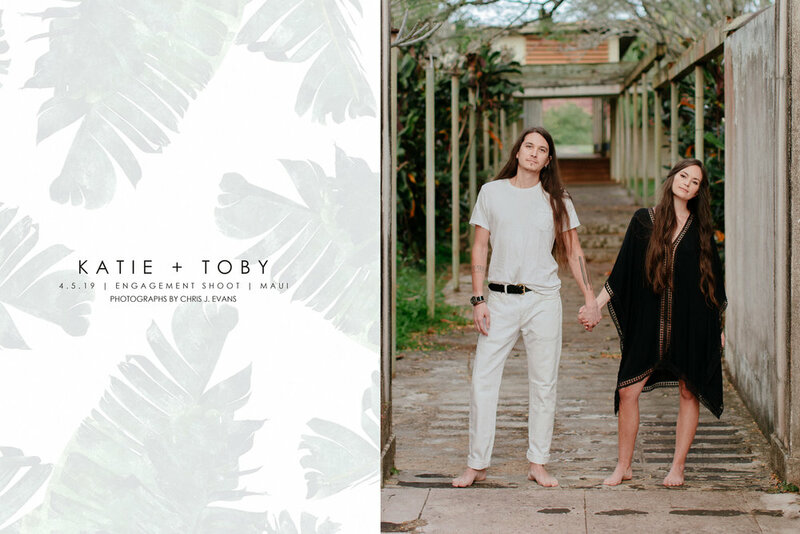 Maui Wedding Photographer CHRIS J. EVANS shoots modern and fashion driven engagements. 12.26.17 Maui Wedding Photographer CHRIS J. EVANS wins back to back The best of weddings from The Knot Magazine. "Thank you to all my amazing clients! I couldn't have done it without you!" 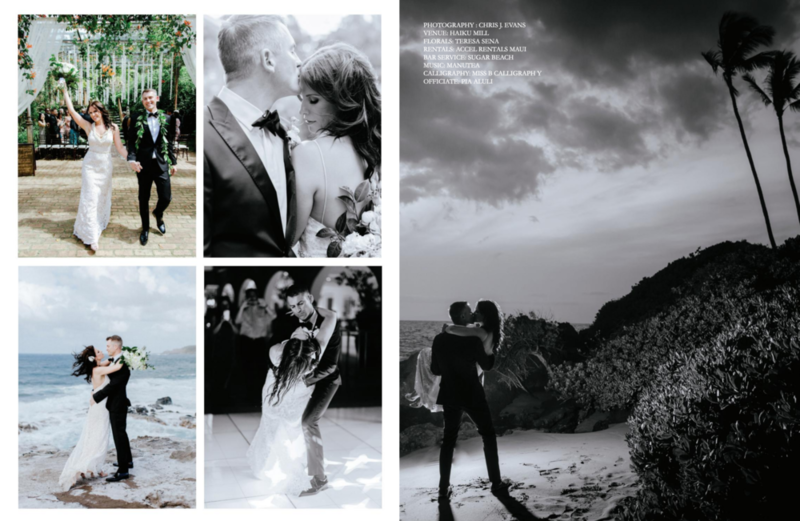 12.18.16 Maui Wedding Photographer CHRIS J. EVANS Real wedding featured in WEDLUXE Magazine. Shot at The Haiku Mill. 12.7.16 Maui Wedding Photographer CHRIS J. EVANS shoots luxurious night portraits. "I love shooting when the sun goes down, there is something so romantic about the night. I use high powered studio lights to create these magical scenes". 11.6.16 Maui Wedding Photographer CHRIS J. EVANS shoots luxury bridal editorial at Montage Kapalua Bay, Maui. With Unveiled Hawaii, Ines Di Santo, Olive Willow and Hawaii digital Couture. 11.01.16 Pure Lyft Energy campaign photographed by CHRIS J. EVANS. 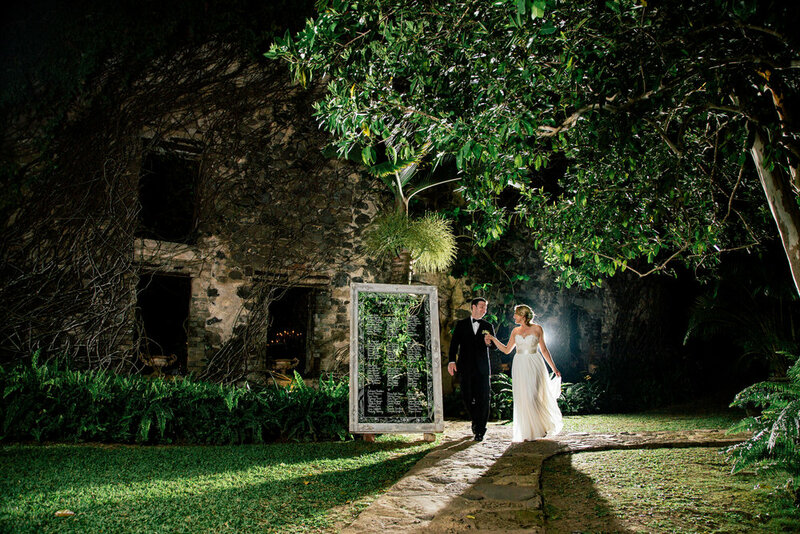 9.5.16 Maui wedding photographer CHRIS J. EVANS presents: Venue Spotlight The Haiku Mill. The Haiku Mill on Maui is one of the most revered wedding venues in the world. Old World Europe meets natural Hawaiian splendor at it's finest. I'll let the pictures do the talking on this one. Visit www.haikumill.com for more info. 8.25.16 Maui wedding photographer CHRIS J. EVANS behind the scenes video shoot of bridal editorial. Here's a glimpse of a photo session we did with Platinum Weddings. It was such a beautiful day for a shoot. Maui provided us with awesome weather delivering pristine lighting for all of our shots. Enjoy! 8.23.16 Maui wedding photographer CHRIS J. EVANS now offering medium format film photography. The soft effortless look and feel of film is beautiful and undeniable. The organic process and the need to slow down for each and every frame captured is definitely its own art. I am pleased to now offer film photography for my clients. Enjoy a small sampling below. Maui wedding photographer CHRIS J. EVANS on shooting group portraits. Group portraits in my opinion are one of the most important parts of any wedding day celebration. I love crafting iconic images of family and friends. The trick is to embrace each member of the photo and highlight their persona. These are not the wall of people portraits you've seen before. Since these photos are often produced very quickly due to timeline requirements this is where the difference between a seasoned professional and a new photographer is most revealed. I will have my assistants ready the scene with chairs and furniture. With a complete list of all the requested groupings in hand, it runs like clockwork. As each group of people is assembled I have roughly 1-2 minutes to pose each person in the photo and about the same amount of time to shoot the scene. I try to capture a nice variety with the smile shot, the serious shot and the fun shot. Maui wedding photographer CHRIS J. EVANS on The White Orchid Weddings Beach House. The Beach House from White Orchid Weddings is a gorgeous exclusive property located in south Maui. The romantic sea breezes blow gently set to the backdrop of the pristine Pacific ocean. Lush tropical landscaping and the privacy of the estate make this one of Maui's most sought after venues. Maui wedding photographer CHRIS J. EVANS on craft cocktails. Ahhh... that first refreshing sip of an exquisite elixir. Here on Maui it's no secret it's very warm. So what could possibly be better then to enjoy the most fantastic cocktail your senses have ever indulged. I say Indulged because that is exactly what the amazing cocktail geniuses at Garnish craft cocktail catering provide. Not only the are the libations unique, they are simply divine. Served in vintage styled glassware that has been meticulously sourced for that exact liquid concoction. Garnish's bartenders are precise in their mixology and serve every drink with a beautiful smiles on their faces, because they know how happy you're about to become. Maui wedding photographer CHRIS J. EVANS on shooting groom portraits. 6.30.16 | Groom Portraits | Locations: The Haiku Mill, Olowalu Plantation House, Sugarmans Estate and the Olinda Forest. The groom portrait is an often over looked part of the wedding day celebration. I strive to capture my grooms in a very relaxed yet confidant state of mind. Most guys are not immediately comfortable with the prospect of their solo shot. I give a lot of advice in the way of motivation by character type. Imagine you're James Bond, a mega-millionaire on his yacht, a captain of industry. These cues often result in laughter first (which calms all nerves) then 9/10 times my guys get it and snap into these great character versions of themselves. The art of the bridal bouquet is truly astounding. As it not only serves as a beautiful arrangement but also as the brides number one accessory. I want to share some of my favorite with you, from small compact simplicity to over the top arrangements of lush gorgeous fauna. Enjoy! Maui wedding photographer CHRIS J. EVANS shoots at The Haiku Mill. 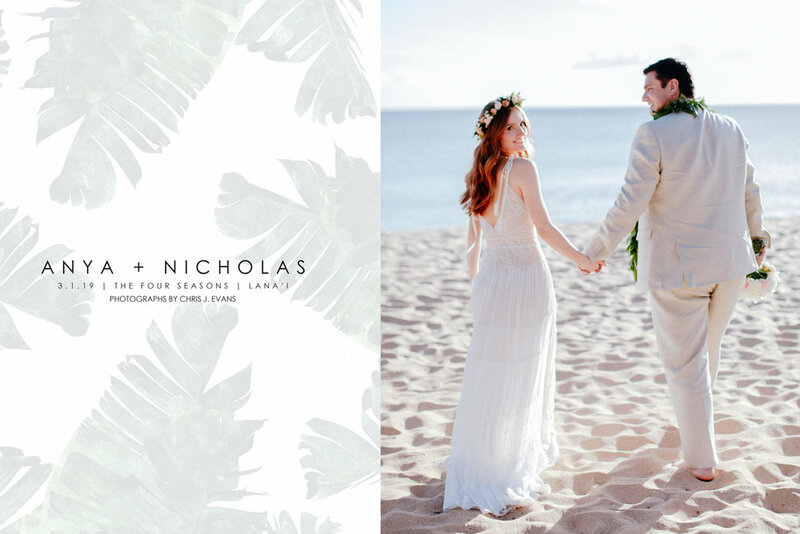 Destination Wedding Details by Maui Wedding Photographer Chris J. Evans. Maui Family Portraits by photographer Chris J. Evans. Chris J. Evans Photography uses his background in editorial and fashion photography to capture Jamie and Nicolo's intimate engagement shoot. Their playfulness set against the backdrop of Hui No'eau Visual Arts Center, located on a twenty-five acre historic estate on Maui. Flowers and set design: Wildheart floral and event design. 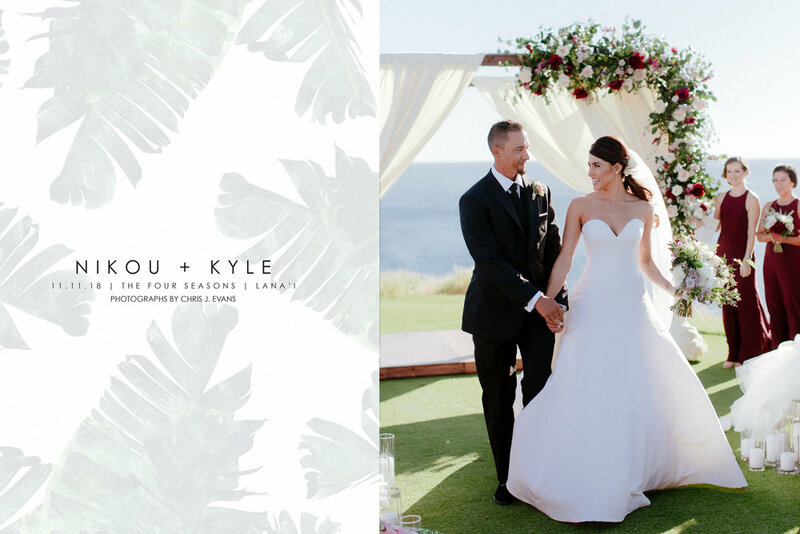 Music by: The Kooks "Seaside"
Pacific Weddings Magazine: A gorgeous shoot at the White Orchid Weddings Maui beach house. Photographs by Maui wedding photographer Chris J. Evans. Lanai Four Seasons. Melissa & Alex exchange vows on a seaside cliff with the sun sinking into the sea. Min & Louis say I do on a gorgeous beachfront private estate on Maui. 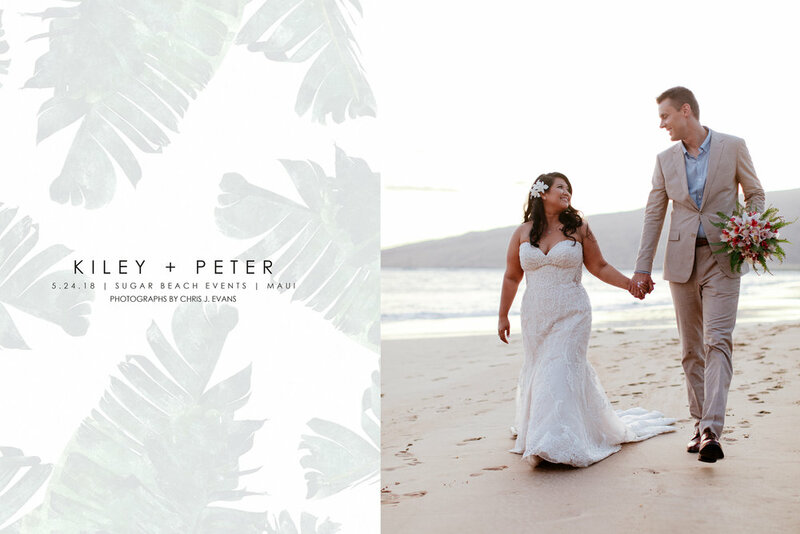 Tessa & Joe get married in beautiful Kuau cove.